Toolstation is one of the fastest growing suppliers of tools, accessories and building products for professionals and serious do-it-yourselfers. Our multi-channel concept offers our customers the opportunity to order in one of our branches in the Netherlands or through customer service online. We offer much more than just tools; electricity, installation, screws, fasteners, workwear and many professional brands are part of our extensive range. The full range is available in the online shop, catalog and at our branches. Toolstation was founded in 2006 and operates a professional team with one focus; the lowest price, all in stock and a good, fast service. The full range is in stock in our branches – to help customers get what they want and as quickly as possible. Click here for the nearest branches, addresses and opening times. 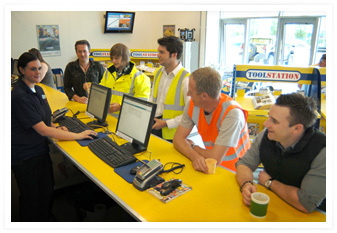 Also, we hold all products in stock at the central warehouse – so that we can deliver within 24 hours. Orders from €10 will be delivered free of charge.